A vast field of bright yellow sunflowers stretches to a distant horizon, with lazy summer clouds and a flock of dark songbirds. The field has around 10,000 sunflowers, all in full bloom at the same time. Each individual sunflower differs from all others in color, size, shape, position, etc. Even the petal counts vary from one flower to another, rather like a real field of sunflowers. The prints which are offered have a pixel density of 300 pixels/inch in the original file and the print shows vastly more detail than you can see here. 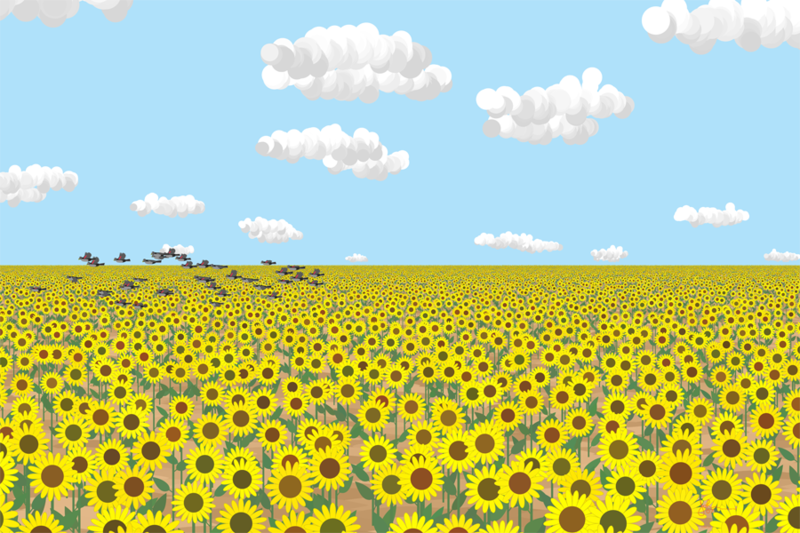 Every sunflower is shown (resolved) in the print, all the way to the horizon. The perfect picture for those who long for infinity. Vast sunflower fields like this can be seen in South and North Dakota in June and July and are a quite arresting sight with each flower facing east toward the sunrise.